TYPICALLY, I START WITH A BASELAYER. I USUALLY WEAR THERMALS UNDERNEATH MY RUNNING APPAREL. 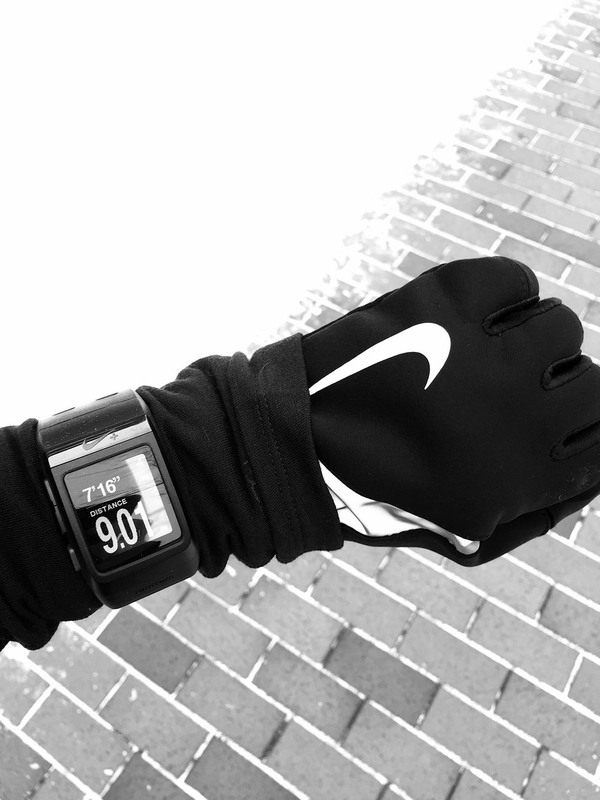 IT KEEPS THE HEAT IN AS BEST IT CAN AND I AM ABLE TO WITHSTAND THE COLD TEMPS DURING MY LONG RUNS. THIS WINTER, NIKE'S AEROLOFT HYBRID RUNNING JACKET HAS BEEN A LIFE SAVER. IT HAS AEROLOFT TECHNOLOGY THAT DISPERSES HEAT TO ENSURE LASTING WARMTH ALONG WITH GOOSE DOWN INSULATED TRAPS AT THE CHEST AND BACK. IT'S LIGHTWEIGHT, PACKABLE AND COMPLETELY VOID OF FUSS. THE SHAPE FITS SEAMLESSLY AND ALLOWS FOR OPTIMUM MOVEMENT, ALL THE WHILE KEEPING THOSE FRIGID COLD TEMPS OUT AND WARM VIBES IN. THE BOTTOM HALF OF MY BODY GETS COLDEST THE QUICKEST- IRONIC SINCE IT'S CONSTANTLY MOVING- SO I AM ALWAYS LOOKING FOR WAYS TO PREVENT THIS. I WEAR THERMAL LEGGINGS UNDERNEATH MY RUNNING TIGHTS AND TWO PAIRS OF SOCKS TO SHEILD MY FEET FROM THE WIND, SLEET AND SNOW. 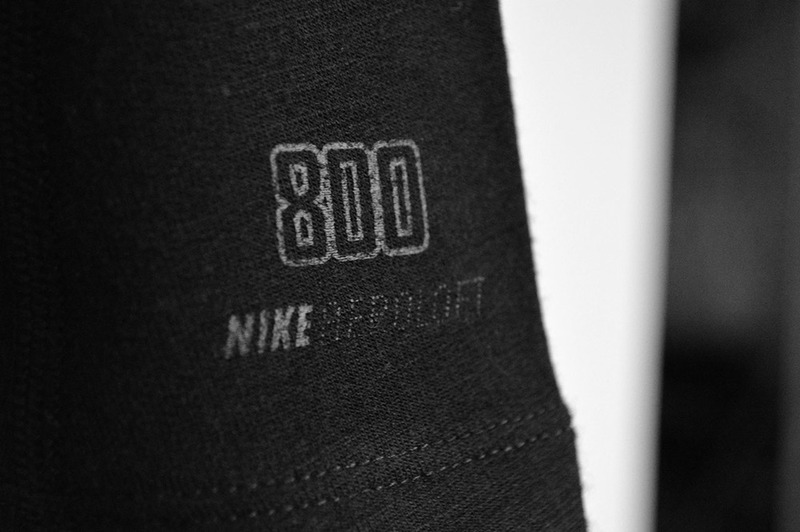 ON THIS MORNING'S RUN, I ROCKED NIKE'S FLASH RUNNING TIGHTS, PERFECT FOR SWEAT-WICKING AND LOW LIGHT/VISIBILITY. MY HANDS NEVER NUMB WEARING VAPOR SHIELD GLOVES. AS PER USUAL FOR LONG RUNS, I SWEAR BY MY LUNARGLIDES WHICH ARE ALWAYS LIGHT AND ALWAYS RESPONSIVE. THE AMOUNT OF SALT ACCUMULATED ON EVERY SURFACE OF THESE SNEAKERS PROVES INCLEMENT WEATHER DOES NOT STOP THIS CHICK. ONE OF THE MOST IMPORTANT ELEMENTS OF RUNNING IS RECOVERY. MY RUNNING COACH, GERARD PEARLBERG, CANNOT STRESS ENOUGH THE SIGNIFICANCE OF TAKING CARE OF YOUR BODY POST RUN. I DO THIS BY STRETCHING AND REFUELING WITH A BALANCE OF PROTIEN, CARBS AND FLUIDS. AFTER THIS MORNING'S 9 MILER, I FOAM ROLLED 2 MINUTES EACH LEG AND SCARFED DOWN 2 EGG WHITES WITH BERRIES, OJ AND A PROTEIN SHAKE. I CONTINUED TO HYDRATE THROUGHOUT THE DAY AND PLAN TO STRETCH AGAIN BEFORE BED. WHEN THE WEATHER IS AS BITTER AS IT IS, IT'S CRUCIAL TO KEEP YOUR BODY WARM. A WARM BODY MEANS WARM MUSCLES. AND WARM MUSCLES MEANS LESS INJURY. COLD WEATHER PREP IS NO JOKE. WINTER IS HARDLY OVER ACCORDING TO PUNXSUTAWNEY PHIL AND WE HAVE MILES YET TO RUN. BUNDLE UP, IT'S COLD OUT THERE.